Instead of finding it food or addressing any potential illness, Montana Fish, Wildlife and Park (FWP) officials ended up killing the moose and blowing its carcass up with explosives – right alongside its deceased mother and another dead calf. The whole grisly episode began on Monday, when Hohm took a camping trip out to Montana’s West Boulder Campground. He was still in the woods when RT spoke to him by phone. "I was simply walking through the woods with my two dogs and out of nowhere this day-old moose calf was walking right up to me with his little distress calls," Hohm told RT, referring to the baby moose's cries. Hohm knew that its mother would likely be nearby, and it probably wouldn’t appreciate it hanging around humans. Instead of discovering an angry cow moose, however, Hohm found the mother close by, lying dead next to another calf that had been stillborn. "I was with the calf for about seven or eight hours until the Fish and Game Department was able to get to the location," he said. He then left the calf with the wildlife officials, who said it would be taken care of. And it was, but not the way the Good Samaritan expected. "When I left the animal in their care... very shortly after, they shot it in the head. They didn't remove it from the premises, there were no tests taken, they simply waited for me to leave and they dispatched the animal," Hohm said. "Really, all they needed to do was provide some food for the little guy. I called them for help and I guess I expected them to do a little bit more than just shoot the calf and detonate the body." “These guys are on our payroll to oversee the protection and well-being of these animals and this is how we ‘manage wildlife?’ It’s quite disheartening.” Hohm said to local KXLH News. While Hohm and others may be shocked, the Montana FWP stands by its behavior, saying trying to find another home for the moose was out of the question, and that the agency acted to prevent disease from spreading. “We don’t move or rehabilitate moose,” FWP spokesperson Andrea Jones said to the Daily Chronicle. Jones said that while bears or birds of prey may be taken in and rehabilitated, moose, elk and deer are a different story due to their disease-carrying potential. 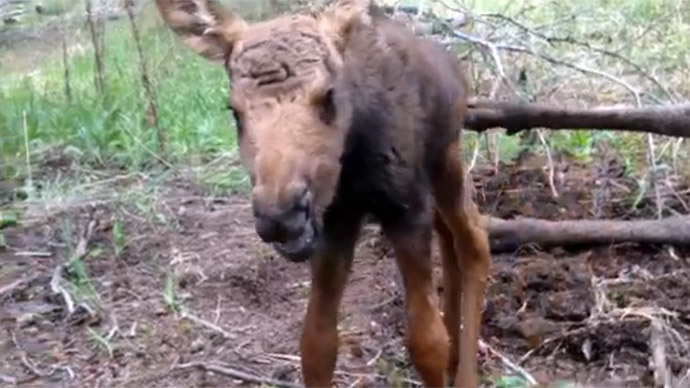 The mother of this baby moose was also infested with worms, she told KXLH. “They can carry chronic wasting disease which can be very devastating to populations; it’s also very dangerous to humans,” Jones said. She also said that without its mother, the baby moose would have starved.